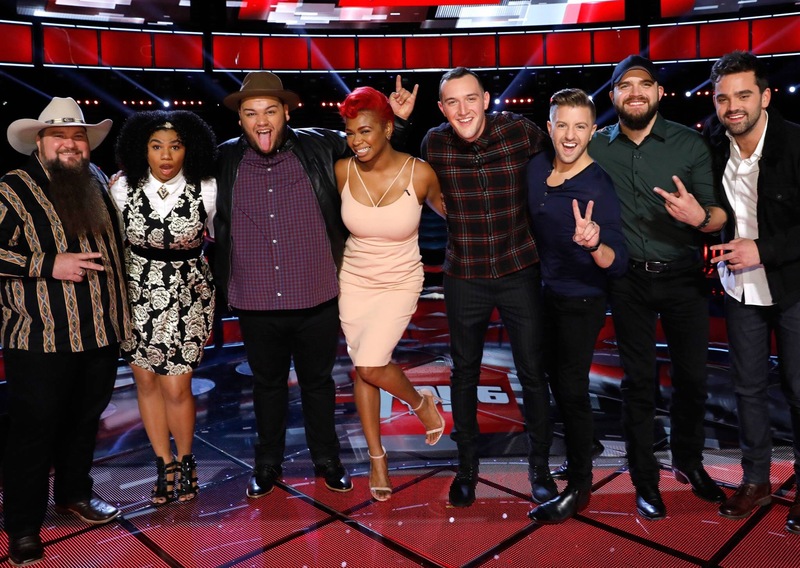 This week, the Top 8 singers will compete for your votes on The Voice. The performance show airs on Monday, December 5th at 8:00 PM on NBC while the results show airs on Tuesday, December 6th at 8:00 PM. Last week, Austin Allsup and Courtney Harrell from Blake Shelton’s team and Aaron Gibson fron Miley Cyrus’s team were in the Bottom 3, with Blake’s singers suffering elimination. We shall see what happens this week. It looks like Adam Levine is sitting might cozy with 3 singers left in the Top 8, one of them being the superb Billy Gilman. He should sleep nice and easy over the next couple of weeks because -c’mon – you know Billy is going to win this thing, right? Or am I wrong? Time will tell. Who are you rooting for? Please share your thoughts in the comments section. Time will tell…… The best singer don’t often win…. But we have to admit, he has an incredible voice……. The power and that range, and of course tonight a Celine song….. Again, another one of those superior vocals to cover…… He will be fine tonight…. If the voting is following the iTunes rankings, it’s going to be a tight finish. As of midnight, seven of the eight artists were at number 21 or higher on iTunes. The lone exception was Aaron. according to today’s itunes..it could be sundance, billy, josh, and christian staying tonight. they are in the top 5 as of close of voting time today. maybe brendan, maybe we, however those two aren’t in the top 10 at this moment. brendan could be there based on voting from the past. That performance of Billy’s was again, insane…. Holding that note for 15 seconds….. I have a strange feeling it is going to be Sundance and Billy as the last 2 remaining……. Amazing singer! One of their best for sure. Ever. i really miss all the people (where are you gene?) who normally discuss here….. I was very disappointed that Ali was not voted into the final four instead of Josh. It appears that the majority of The Voice voters are country music fans. Josh is good at what he does, but Ali is spectacular, in my opinion. I second that about Ali. I prefered Ali to Josh as well but the winners of the last two seasons would suggest that the worm has turned on the makeup of the audience of The Voice. It appears to lean Pop now. Ali was a R&B / pop singer, singing a country classic that had a second life as a pop / soundtrack song when she was voted off the island. She had all of the bases covered. Go figure. I think the twitter save completely distorts the outcome of this (so called) contest. While I strongly support iTunes sales as a voting method, I don’t like the cumulative iTunes tabulation. A contestant with an early head of steam can’t be overcome latter in the contest because of it. For at least the last three seasons the winner has been a forgone conclusion. It appears that the model of bringing back nationally known artist that have had major label contracts to take another bite of the apple is catching on. Billy Gilman’s debut album went double platinum and he was nominated for a Grammy for heaven’s sake. I understand that it isn’t a contest of true amateurs but, as far as I know, Ali and We have no professional experience, Josh and Sundance are bar singers. Maybe they should change the format into a head cutting contest where they have a reining house champion and bring in new challengers each week to try knocking him off of his throne. The current format is nothing more than a reality show..
My pick for the winner would be Sundance Head; after last nights performances, I think he was “heads” above the rest of the competitors. Alisha sounded horrible last night, that breath she took in the middle of what should have been a long breath note was very distracting! I’m hoping Sundance can pull it out too. He’s very genuine witha remarkably good voice. We’ was “way” better than Alicia last night, but I don’t care much for Alicia as a singer anyway. Sundance has something in common with Keith Richards of the Rolling Stones. Anybody know what it is? i’m glad ‘you guys’ are writing. i was hot to trot to write this morning and i kept waiting for her to put up a new blog and then i had to leave. i too loved sundance last night. when he sang etta james’ ‘at last’ it blew me away and i thought ‘this is going to go to number one. after the show i checked itunes and it was waaay below. i couldn’t believe it. and then i thought, well, there hasn’t been enough time yet. this morning it was at #2. his original was and is #1.
there is something about him. i would not have expected i would love ‘at last’. i usually like very spare production. and i’m not thrilled with steel guitar. but!! the doo-wops, and the steel guitar, and the whole bit to me was just brilliantly produced. what you call ‘very genuine’ gene, i’ve been thinking of as ‘charisma’. he just ‘has it’. and yes, ha ha, in a very genuine way. also, i loved how they had the video of sundance’s dad dancing in back of blake and sundance as they sang. and the dad crying. all very emotional. i loved it. alisha misjudged as a coach. she should have given we a popular song..something like ‘take me to church’ which was probably we’s best received song. it seems like alisha is wanting to show us all of we’s tricks, but not well integrating them. i did enjoy the ave maria performance with the two of them. not perfect, but could be if worked on some more. we really is amazing. i note how adam seems to have so much more fun and ease with josh as opposed to billy. billy doesn’t seem to have an ease with himself. I loved the duet with Blake too, his dad had some moves didn’t he. I thought everything about that worked. Hunter Sundance and Keith both play their guitars strung with only five strings. Re: “At Last” I was mixed on that song. I love Etta James oiginal so I started off with the “you’re screwing the song up” reaction to it, but before long I lost touch with it being the song I knew and loved and begain to enjoy the Do Wop spin he was putting on it. I bought it when the show was over. I was really glad to see him do “Treat Her Right.” I had hoped he would do it, but closer to the original version, all season. It was really cool the way they ran the Roy Head footage behind him. Roy could give James Brown a run for his money on the dance floor. That footage may have been from a show called “Shindig.” I mentioned before that I remembered him from his heyday. I saw him and the Traits perform at a sock hop near my house back in the day. It was pretty cool seeing him getting emotional seeing Sundance having his big moment singing his old song. Yeah, it’s the five string thing. I’m suprised that you liked his “At Last” version. Billy’s call back performance was pretty cool. You don’t like steel guitar? It’s not real country without a steel. Check out Paul Franklin some time. You can wring so much emotion out of them. Several rockers have played lap steels on certain songs. I happen to have a 1952 Fender steel for sell if you run accross someone needing one. although, i was going against the norm here, i was fine with josh getting into the finale over ali. because i like his down-to-earthness, his singing, and his chemistry with adam. yes, even though i’m not into country. but..i would have preferred brendon. i should start watching tonight’s show..
gene, loved your comment about sundance’s version of ‘at last’…and that you bought it. i’ve been playing it over and over on itunes. Cool on the five string thing! 😃 I did like his ” At Last” version; I thought he was magic last night. Yeah the beard thing, ha ha. I’m not a Kiss fan either, but ZZ Top is another story. Did you ever notice that their drummer is the only one who is clean shaven? Three guesses what his name is. Give up? Frank Beard!!! Wowzer’s, I like the country gal who sang with Josh, “Cam”? What a pretty, clear, pitch perfect voice. Yeah. she does have a nice voice. That’s her song. I’ve never heard her sing anything else though. Sundance Head Is the Voice! I guess we have a new genre too. Soul Country. I was rooting for Billy but had a feeling that Sundance would win based on the iTunes results. Congrats to him. I read an artical a little while ago that suggest the reason that Voice contestant don,t go anywhere in the music industry is because the creators and producers of the show have no connection with the industry. Unlike American Idol or the X Factor that were created by music industry professionals, the Voice is headed entirely by television people, more specifically, reality show veterans. It’s good to see the big stars interact with the contestants in the finale. Many great performances came about in Idol season enders. Having established artist come on and take up limited show time in an unrelated performance is boring for me. Gene and Hunter, if you get a chance take a listen to this young man. He’s somewhat of a local boy, he’s down state of me. Stumbled across him and have been hooked. I’m not a country music fan, select on the few that I do like, but this guy has become a front row contender.